John Huntsman is somebody most people without a strong interest in politics have never heard of - he's the popular two-term Republican Governor of Utah. Yesterday he was appointed by the Obama administration to be the Ambassador to China, and the reasons for this are pretty obvious: he's been a successful and popular governor, he's fluent in Chinese (was a Mormon missionary in Taiwan before) and even has an adopted daughter from China, so he's clearly a perfect match. 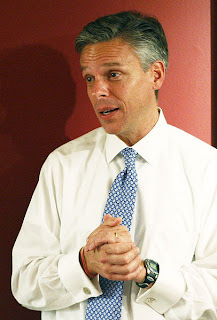 By all accounts, Huntsman stood a good chance at securing the 2012 Republican presidential nomination, if only for the fact that he is the conservative antithesis of Obama: He’s a moderate, young, and attractive politician. Those are the grounds on which Obama won, and those are the grounds on which they fear he’ll lose it in 2012. By co-opting Huntsman, Obama will have successfully pacified the lone Republican 2012 challenger, thereby ensuring a stable route to victory. Then, of course, is the knowledge that he’ll likely receive Republican praise for his gesture of bipartisanship, however politically shrewd it may be. Stood needs to be changed to stands, because there's absolutely nothing about being Ambassador to China that removes one from the list of presidential candidates. Taking a look at the list here you can see that the first George Bush was a liason to China (that was before there were official ambassadors), and also that these positions only last from two to four years on average, though they can last much longer than that - Clark Randt was ambassador for eight years. Because the position as ambassador has a very fluid duration, this is actually a plus for Huntsman: when 2010 and 2011 come around he'll be able to take a look at the political scene from a position of comfort, and if it looks like Obama is cruising to re-election (which is very likely) then he could simply stay in China as ambassador for that much longer, building up his résumé and waiting for the next opportunity. Other previous candidates don't have that opportunity, because they're not really doing anything. Mitt Romney isn't governor anymore, no idea what Giuliani is up to, etc. These people will have a hard decision to either try to run for president again (and likely lose) along with the national media coverage that follows, or wait it out and hope that four years later they'll still be just as prominent on the political scene even though they don't really have anything to display on their résumé over the last four years. Huntsman is also a self-proclaimed fan of the progressive rock genre and on July 30, 2007, attended a concert by progressive metal band Dream Theater. Later that day, Huntsman signed a proclamation creating "Dream Theater Day" on that date for the state of Utah. According to Dream Theater's website, Huntsman is a keyboard player. On that note, here's Dream Theater's Pull Me Under.